Throw together “The Exorcist“, “The Changeling“, “The Amityville Horror“, “Poltergeist” and “Paranormal Activity“, shake it well and finish it with masterly camera work, and you get this horror gem as a result. Only “Drag me to hell” also got my appreciation and I judged this one as being a decent horror film since they don’t make them so well anymore recent years. Nowadays it’s more teen-horror like “Twilight“, paranormal nonsense like “Paranormal Activity” and crappy footage horror. James Wan however, has the talent to make a sizzling movie using the tension and an image-building that fascinates you and makes sure you keep on watching. It’s again full of cliches and situations that are used countless times in other films. And yet it’s all subtly intertwined and transcends the other horror crap that I have been presented with before. 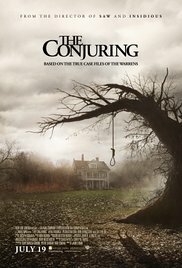 So, “The Conjuring” is an outstanding horror with a somewhat disappointing ending. It gave me a feeling as if it needed to be finished in a rush. Most films would still end up with an appearance in the music box. This movie is at that point masterfully,because here it doesn’t happen. The fact that this film is based on a true story (which I doubt) gives this film an extra dimension.